For more than 60 years the Troy & Wentzville Veterinary Clinics have been helping the people of Troy, Wentzville, Moscow Mills, Cave, Flint Hill, New Melle, and throughout Lincoln and St. Charles counties maintain the health and wellbeing of their companion animals, beef cattle and equines. For our clients who own companion animals such as dogs and cats, we understand how much your pets mean to you. After all, we are pet owners too and we consider our furry friends to be members of our families. The same is true for our clients who own horses. The doctors and staff of the Troy & Wentzville Veterinary Clinics have grown up around horses and in many cases still ride. We share your love for these beautiful animals and consider it a pleasure to provide high quality veterinary care for them. To our farming friends and neighbors, we are here to help you protect the health of your herds, and to maintain and increase the productivity of your livestock. This means we will not only provide the best preventative and medical care possible, but use our large animal expertise to provide important advice on optimum farm conditions. The Troy & Wentzville Veterinary Clinics believe that all animals deserve to have the best medical care available, just like people. Whether it is preventative or emergency veterinary care, we are dedicated to being the best choice for quality veterinary services for all of your animals. 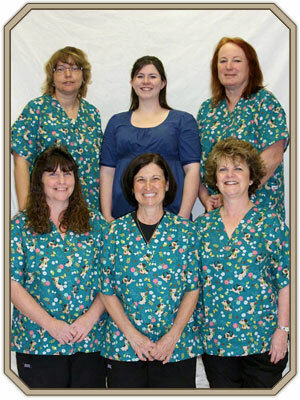 Our entire staff provides experienced, loving care for your animals. We have an unbeatable track record to prove it: many satisfied customers, and many more healthy and happy pets. Please give us a call – we look forward to hearing from you!